Sarasota, Fla. — The news on Tigers’ third baseman Jeimer Candelario was good. 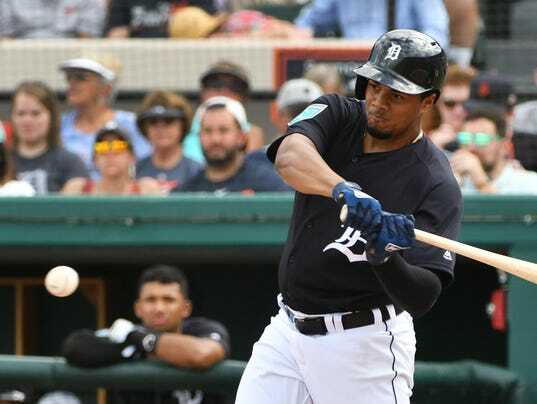 Candelario and Orioles starter Kevin Gausman collided behind home plate during a five-run second inning in the Tigers’ 8-6 exhibition win Monday. Candelario was on deck when Leonys Martin singled sharply to center field, sending Jason Krizan around third and barreling toward home plate. Candelario was running behind the plate to be in position to tell Krizan where to slide and Gausman was running to back up the throw. The two collided and, according to Gausman, the visor of Candelario’s helmet caught him in the face and cut him above his eye. Gausman was given a concussion test and left the field. He was taken to hospital for observation but checked out clean and returned to the clubhouse. Gardenhire said Candelario’s knee went into Gausman’s stomach. Candelario initially stayed in the game and worked a walk. But it was clear, as he went to second on a single, that he wasn’t moving comfortably. Trainer Doug Teeter came out to check on him a second time and Candelario was removed from the game. He added, with a grin, that it is rarely an issue for him.